Limb pad located at the metacarpophalangeal joint or metatarsophalangeal joint. 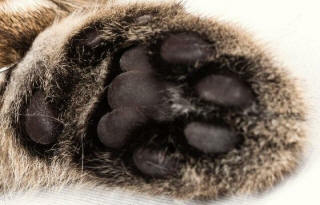 This is the largest of the pads on the palmar or plantar surface of the feet of dogs and cats. The impression or indentation made on the substrate (ground) by a foot. A rounded part of a heel pad. The series of traces made by, and left behind, by an organism. This includes tracks and sign. The distance from the one track of a foot to the next track of the same foot. This is conventionally measured from the proximal edge of the first track to the proximal edge of the next track of the same foot, and parallel to the central line. The width of a trail pattern. This is conventionally measured from the most lateral point of a left track to the most lateral point of a right track, measured at right angles to the central line. Therefore, this is the broadest possible measurement of width of a trail. This should be contrasted with a track, which is an individual footprint. The marks or traces left by an organism (e.g. 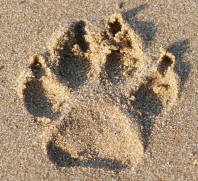 footprints, tail drags and belly drags). Small lobes, or lobular parts of a lobe. Lobules refers to the two rounded parts of the distal edge of the cat’s heel pad, reserving lobes for the three larger parts of the heel pad.